Learner Outcomes: Students will be familiarized with one method of creating an acrylic painting from start to finish. They will experiment with the acrylic paint as a medium, especially the technique of layering in glazes. 1. 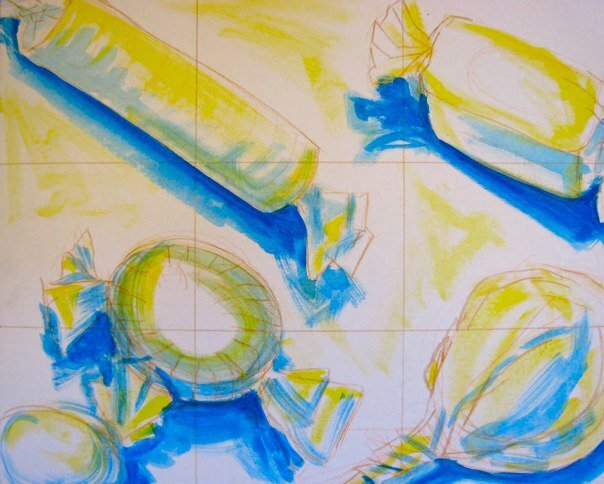 Starting the Lesson: Introduce Wayne Thiebaud and discuss his use of color in composition. 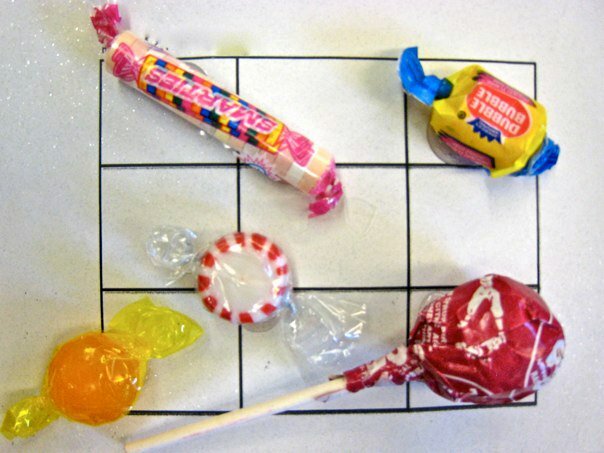 Review basic composition rules (as shown in the first photo below) before students experiment with arranging five candies. They will create 4 possible arrangements with these candies and then choose the most successful composition. Once chosen, the candies can be hot-glued to the card stock grid (as shown in the second photo below). 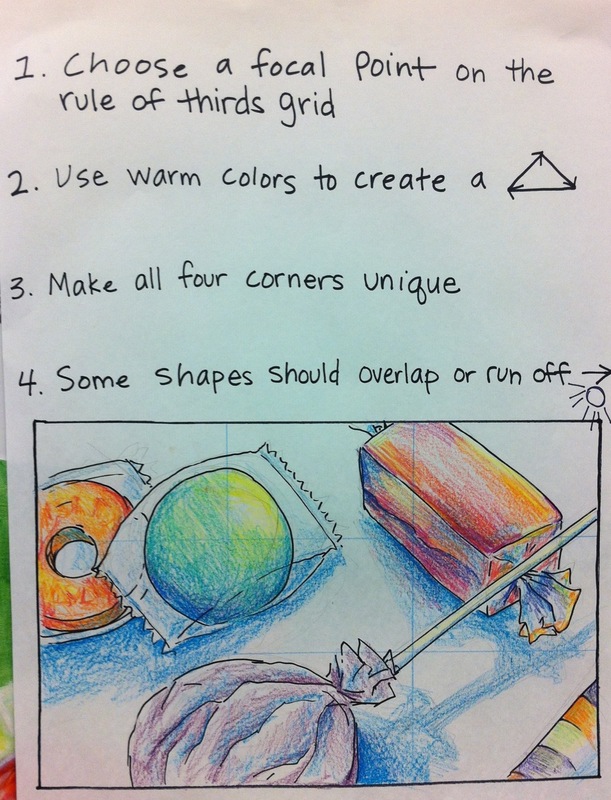 If students complete this stage before their peers, they can move ahead to prepare their canvas with a rule of thirds grid sketched in colored pencil. 2. Behavioral Expectations: Students will be responsible for keeping their workspace neat and treating the materials with respect (especially washing their brushes in between colors). Students are expected to give informal constructive peer critique through the studio process to guide each other. 3. Organizer: Break each studio session down into three or four steps and write it on the board, or project it on a screen, so students know the next layer they can proceed to if they complete their current step. Demonstrate multiple methods of shading in thicker acrylic paint for the overpainting, use Thiebaud examples as a reference. NOTE: White paint is given only at this stage in the project. Black paint is never distributed, rather students are encouraged to mix their own unique dark tones using a combination of deep blue, purple, red and green. Students will peer critique and take notes to guide their finishing touches.